History: (Tales of Suspense I#86/2 (fb) - BTS) - Yashonka was a secret research center in Asia, created with the purpose of inventing special, technologically advanced, destructive weapons. Its creators wanted to use the weapons against the "decadent" west to conquer it. Its organization was militaristic. Several soldiers granted safety and were led by officers, who had their own quarters within the citadel. The highest in rank was General Chou. The soldiers were equipped with ordinary guns and rifles, but also with many special weapons. Yashonka built several special weapons and destructive devices: armed carts, monstrous robots, thermal bombs, Beeper Dogs, Solar Guns, Air-Cars, atomic missiles, Phosgene Gas capsules. The most destructive weapons that Yashonka had created was the Z-Ray. SHIELD heard rumors about the Z-Ray and one of their best agents infiltrated Yashonka's ranks. He was Agent 60 (Kuro Chin), and in Yashonka he became a Colonel. The Z-Ray was too severely protected, and Kuro Chin did not succeed in reaching it. Months later SHIELD sent Captain America to Yashonka. (Tales of Suspense I#86/2) - Captain America sneaked into Yashonka, but was soon discovered by the alarm sensors. Yashonka's soldiers attacked him, but they were defeated and lost him when he hid inside the electric conduits and after that in Colonel Chin's quarter. Shortly after that the Beeper Dogs found the American again. He fought and held back the soldiers, but an Air-Car hit him when Colonel Chin shot at it. Using the same Air-Car, Captain America flew to the Z-Ray. Yashonka's soldiers erected a Phosgene gas barrier behind him, but the Captain was too fast and reached his target. 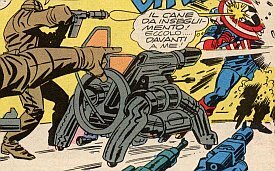 General Chou ordered to launch all missiles to destroy the intruder, but Captain America used the atomic missiles of the Air-Car and destroyed the Z-Ray, and with it, also the missiles launched by Chou. The following explosions destroyed the research center. Comments: Created by Stan Lee (writer), Jack Kirby (pencils), Frank Giacoia (inks). Apparently Yashonka was completely destroyed. To me it seemed like an oriental version of AIM. 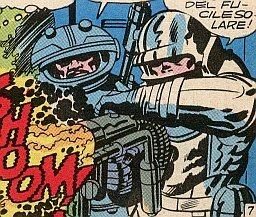 In only 10 pages Lee and Kirby created a whole terrorist organization, with its own purpose, its soldiers, its special weapons...and destroyed it! Yashonka's crest was a red 'Y' over a black triangle. The red is a reference to the communist block, the triangle probably simply is an 'A', the last letter of Yashonka, or the "Triad", or had one among many mystic meanings linked to the triangle symbol. Yashonka has no known connections to any other group or character with a similar name. or any other item or character with a similar name. Colonel Kuro Chin was a SHIELD agent and knew Nick Fury and Sharon Carter, Agent 13. Kuro Chin worked for SHIELD as Agent 60 and infiltrated Yashonka, becoming a double agent. There he became Colonel and despite strict surveillance, he sent various reports to SHIELD for months. 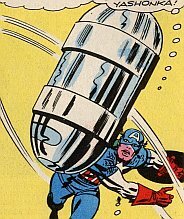 He could not reach the Z-Ray, which was the weapon that worried Nick Fury and SHIELD the most. When Fury didn't receive confirmation for the Z-Ray's destruciton Fury sent in help: Captain America. Kuro Chin lived in the officers section of Yashonka, building 19, room 7, and it was there that Captain America found him, after having invaded Yashonka. Kuro Chin had just taken the papers describing the posistion of the Z-Ray. A platoon came to investigate in his room, but Kuro Chin hid his fear of them well and sent them away. Immediately after, however, his mask of courage crumbled and he was yielding to the strain. They had to destroy the Z-Ray, but Captain America had to leave Kuro Chin in his room. However, Kuro Chin found his last ounce of courage and intervened in the following battle between Captain America and Yashonka's forces. 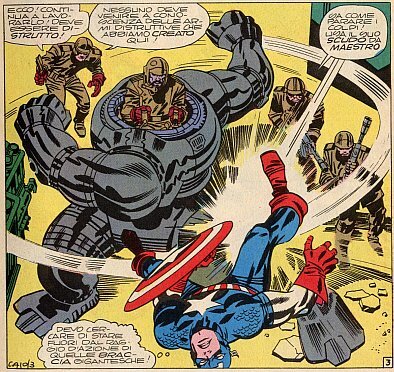 Chin shot at an Air-Car, saving Captain America, but Chin was then spotted and killed by another soldier. His sacrifice let Captain America to destroy the Z-Ray. General Chou commanded the military forces in Yashonka. Chou was only seen at the end of the battle when Captain America was flying toward the Z-Ray and the last chance to kill him was to launch all the missiles against him. General Chou called the "critical condition" and had the missiles launched. The attack failed because the missiles did not reach Captain America and instead added to the explosion triggered by the hero to destroy Yashonka. The armed carts wer vehicles with 4 tractor wheels with a machine gun attached on the top. One man was enough to drive and to use it. They were vehicles used by guards to scour quickly through Yashonka. A very useful feature due to the vastness of the complex. The monster robot was controlled by one man sitting on top of the body (where the head is normally located). It was 13 feet tall, had great manoeuvrability and possessed enhanced human strength. It was also very resistant to intense heat. They were cilinders as tall as Captain America's shield. They were very dangerous, containing an inflammable substance. If broken they exploded releasing the substance, immediatly set the area around it ablaze. The heat released by the bombs could kill a man. They were robots very vaguely resembling a dog. Four-legged robot with little wheels and a little cannon for a head. It was a tracking device that could always find his prey. It could be easily destroyed by a strike on its electronic circuits, but if broken it released a deadly electric shock that killed everyone near it. Solar Guns were a sort of flamethrower, producing heat so intense that it could melt steel within a fraction of a second. To use it the soldiers had to wear a special suit for protection from the heat. The Air-Cars could fly and shoot. They were equipped with a front cannon and two atomic missiles stored within the hull. It was very resistant to ordinary projectiles. One was used by Captain America to reach the Z-Ray, flying at high speed through a cloud of gas and using its atomic missiles to destroy the Z-Ray. Green, venomous gas, contained in capsules. It was one of the last defenses around the Z-Ray. The Z-Ray was the most dangerous weapon among the ones built at Yashonka. It was probably a weapon of mass destruction.